This is a great dinner replacement juice; it is suitable for the evening as it has a very low glycemic index. 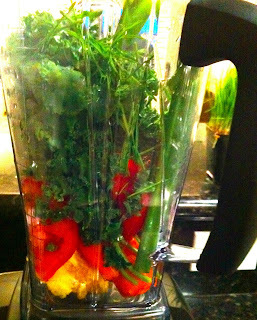 Simply blend a carrot, tomato, parsley, single celery stalk, orange, a whole lemon, wheatgrass, and chia seeds (optional). Add at least 3/4 cup of water or pomegranate juice to dilute this mixture a bit. You can also add pineapple to sweeten the drink. I blended this in my Vitamix as it blends the drink to sheer perfection, but you can blend it in a normal blender - just be sure to add a lot of water. Enjoy! 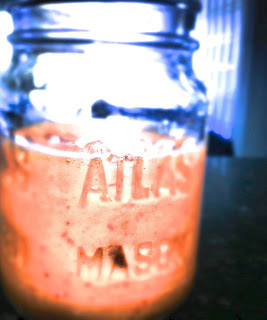 You don't necessarily need a Vitamix for this one: just blend a peach, non-fat vanilla yogurt, and a few ice cubes for what I think is the best drink I have ever had. No joke. This is soo easy and soo yummy: simply blend 1/2 cup of Greek yogurt, a tablespoon of peanut butter, a squirt or two of chocolate syrup, and two frozen bananas. I recommend using a Vitamix to make this: blend on high for 20-30 seconds, refreeze for about 20 minutes, and voila the most amazing, healthy ice cream you have ever had!